Holiday World has announced that they will be making improvements to all three of their wooden roller coasters for the 2016 season. The park’s first wooden coaster, opened in 1995, is the Raven and that ride has already received some new track work meant to keep the terrain coaster as smooth as it can be. The Voyage is receiving thicker uplift steel on the top of the second and third hills and all layers of track have been replaced on a 300 foot section after the ride’s triple down element. The Legend, built in 2000, will see the most changes at the park as it is “reborn” and improved to feature a new themed tunnel and an additional air time moment. Work on the Legend, done by Great Coasters International, will include replacing all layers of track on the first drop and adding more support structure throughout the ride. A new tunnel will take place as the coaster passes under the park’s log flume, adding a new surprise moment. 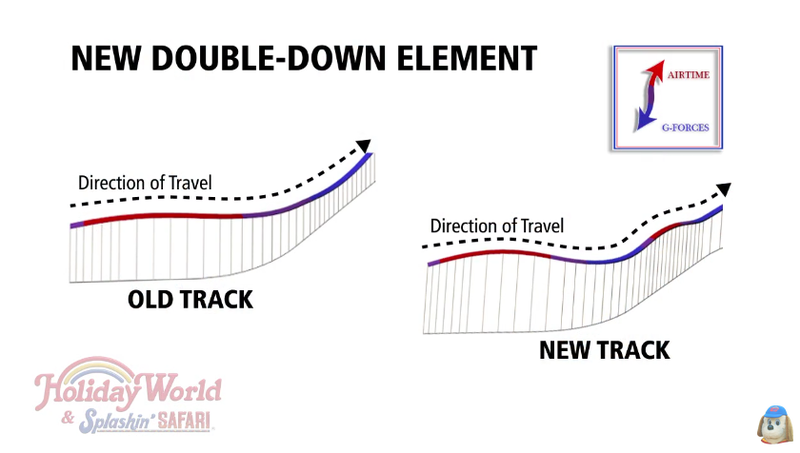 The graphic above is of one of the other changes to the ride, a new double-down element that replaces a downward curve just after the exit of the helix. Another change is a lowered turn just before the new tunnel that will increase the trains speed through the element. Also, the turn before the new tunnel will be lowered.